Published: Feb. 4, 2013 at 08:20 p.m. Updated: Oct. 23, 2013 at 07:53 p.m.
NEW ORLEANS -- When I was a student at Tulane, I learned from experience to get out of town after Fat Tuesday because the following citywide hangover grew oppressive. It feels a little like the day after Mardi Gras here on this gray, rainy Monday in New Orleans, but more satisfying. It feels like the end of an awesome, exhausting meal. One of the nuttiest Super Bowls in memory capped off a terrific week for New Orleans. Perhaps I stayed a couple days extra in the city with my family because I don't want to go home. » I'll remember Baltimore Ravens Joe Flacco completing passes other quarterbacks couldn't attempt in the first half of the Super Bowl. It was a near-flawless performance, one that already seems too underrated. (Jacoby Jones for MVP talk? Really?) So few of Flacco's completions were easy. He was gutsy and smart. He played his best on the biggest stage. » The grouchiest group of people on the planet -- sportswriters -- couldn't help but get charmed nightly by the best city in the country. » I'll remember listening to Randy Moss talking all week, thinking I would never get tired of it. He's not the greatest ever, but it was cool to hear his honesty all week long. » One mistake: Sitting down at a table Friday night with a young man who already was passed out sleeping on one of the chairs. I'll remember his uncle taking photos of said young man as the first-time visitor to the city puked all over Dave Dameshek's shoes. » I'll remember the meals. It's so hard to find a bad meal in New Orleans. Coquette came out of nowhere to win best in show. » The announced Hall of Fame class was as emotional and vocal a group as I can remember. August's induction should be a lot of fun with Warren Sapp, Bill Parcells, Cris Carter and Jonathan Ogden all in the mix. » I was happy for Ed Reed before, during and after the Super Bowl. 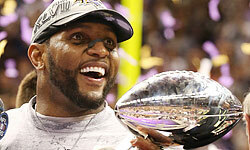 This was Ray Lewis' last ride, but no one had a better time on the journey than Ed Reed. » I'll remember Marc Sessler saying he could see himself getting lost in New Orleans for six weeks or six months and knowing what he meant. Spending all day with the extended ATL crew from Sessler to Dameshek, Dan Hanzus, Henry Hodgson and Justin Hathaway made the week. » I'll make sure that they all remember I predicted the final score of the Super Bowl right by bringing it up often during the offseason. This wraps up my first season as editor of Around The League. It has been such a blast, grind, privilege and joy to cover the NFL for all of you this season. We love football and hope that shines through. We plan to do it so much better next season for you. In the meantime, there's just the combine, free agency, draft and minicamps to cover. The NFL no longer stops; it barely even downshifts in the coming months. Thank you for reading and making this all possible.